In the previous article (http://ponnadi.blogspot.in/2012/12/charamopaya-nirnayam-ramanujars-glories.html) we have seen emperumAnAr's glories revealed by many. Now, we will continue on with the next section where many great personalities (including emperumAn) reveal emperumAnAr's uththArakathvam are explained. When udayavar was explaining thiruvAimozhi meanings to thirukkurugai pirAn piLLAn (who is his abhimAna puthran), while explaining "poliga poliga" pAsuram, piLLAn was filled with ecstasy and emotions. Noticing that, udayavar enquired him what caused this changes in his emotions. piLLAn replies "AzhwAr hailed 'kaliyum kedum kaNdu koNmin' meaning kali will be destroyed, with your appearance in his thiruvuLLam. Per his declaration, you have also revealed that you are that great AchAryan everytime you explained thiruvAimozhi. Thinking about those, I am unable to control my ecstasy and emotions thinking that I am so fortunate to have the sambandham (relationship) with you (who is uplifting everyone per AzhwAr's divine revelation) and to hear the divine meanings of thiruvAimozhi from your divine self directly". Hearing this, udayavar was very pleased. That night, he brings piLLAn and brings him to pEraruLALan (udayavar's thiruvArAdhana perumAL), keeps his lotus feet on his head, and tells him "Always depend on these lotus feet as your refuge; Always show these as the refuge to the ones who surrender unto you as well. Tomorrow, you start writing a commentary to thiruvAimozhi in srI vishNu purANam style (vishNu purANam has 6000 slOkams), i.e., in 6000 lines". Thus udayavar revealed his uththArakathvam himself to piLLAn who is very dear to him. udayavar was explaining the divine meanings of thiruvAimozhi to many along with his sishyas kUrathAzhwAn, mudhaliyANdAn, aruLALa perumAL emperumAnAr. Many AchAryas started taking shelter of udayavar. Hearing this, ananthAzhwAn, echAn, thoNdanUr nambi and marudhUr nambi arrived to srIrangam to take shelter of emperumAnAr. emperumAnAr instructed them to surrender to aruLALa perumAL emperumAnAr. aruLALa perumAL emperumAnAr becomes very anxious and says "this is like keeping a big fruit on the head of a little sparrow; I dont have the qualification to protect/guide anyone; emperumAnAr has appeared as the uplifter of the whole world and he is the apt refuge for us; so always think that the lotus feet of emperumAnAr is the refuge and stay without any anxiety on achieving the ultimate goal". udayavar then tells them "Dont think that I have not done pancha samskAram for you; aruLALa perumAL emperumAnAr doing pancha samskAram is just like me doing it; I will ensure that you have your ultimate goal accomplished" and keeps his lotus feet close to each other and tells them "Always think of these as your refuge". 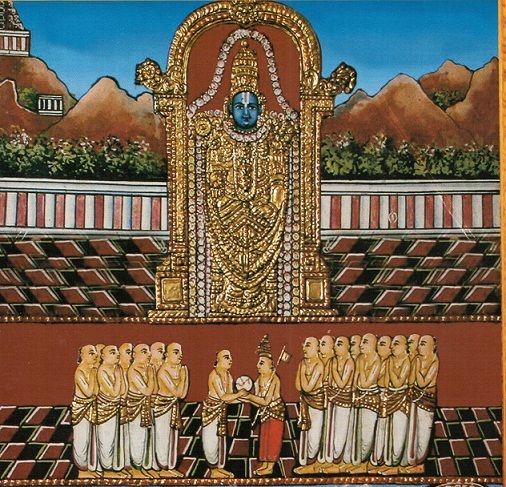 udayavar along with his sishyas desire to perform mangaLAsAsanam to thiruvEnkatamudayAn. He gets the permission of his thiruvArAdhana perumAL (pEraruLALan) and entered thiruppathi. As said by AzhwAr as "vinNnNOr veRpu" (விண்ணோர் வெற்பு) meaning its the mountain where nithyasUris come and serve emperumAn regularly, he hesitates to step on the the hills, just stays at the base of the hills, worships towards thiuvEnkatamudayAn and decides to return to srIrangam. At that time, ananthAzhwAn and other sishyas, offers their praNAmams to udayavar and tells him "if you dont step on the hills, we wont either; So, for our sake, please step on the hills and perform mangaLAsAsanam to emperumAn". Being convinced by his sishyas' dedication towards kainkaryam to thiruvEnkatamudayAn, udayavar immediately bathes, applies Urdhva puNdrams and climbs on the hills with great reverence. Just like a mukthAthmA (upon receiving the order of paramapadhanAthan) will climb on the AdhisEsha paryankam (simhAsanam) of parampadhanAthan after entering paramapadham, udayavar climbed on the hills upon receiving the invitation from thiruvEnkatamudayAn as well. After climbing up to "thiruppariyattap pARai" (a particular part of the hills that is closer to the temple itself), periya thirumalai nambi brings thiruvEnkatamudayAn's prasAdham to udayavar to invite him just like the nithyasUris will wait at the entrance to invite the mukthAthmA (Here we can see the beautiful comparison of paramapadham - thiruvEnkatam in each sentence - such is the glory of this dhivyadhEsam and the emperumAn here). udayavar accepts the prasAdhams and enquires thirumalai nambi why he himself need to bring these (being such an exalted scholar of the sampradhAyam) and if he had not found some one who is of lesser/normal capacity. thirumalai nambi out of great humility and affection towards udayavar says "I searched around all the streets around the temple and did not find anyone lower than me; actually the most apt person to welcome you is thiruvEnkatamudayAn himself; you have mercifully appeared to uplift the entire world; looking at your abilities I am not qualified at all to welcome you, but it is based on the orders of thiruvEnkatamudayAn I am welcoming you". udayavar becomes very pleased and enters the sannidhi of thiruvEnkatamudayAn along with thirumalai nambi and offers his prostrations. thiruvEnkatamudayAn welcomes udayavar through his archakar and asks him "I have already given you the ubhaya vibhUthi ishwaryam (the controlling power for both material and spiritual worlds). What is the reason for your arrival here?". udayavar replies "nAyinthE! Your different postures - lying down, sitting and standing postures are extremely beautiful for us to enjoy. Of those, you mercifully showed me the lying down posture in srIrangam; You showed the standing posture in hasthigiri; But here in thirumalai, you are presenting yourself to both guNa nishtars (ones who constantly meditate on emperumAns divine qualities) and kainkarya nishtars (ones who constantly engage in loving service to emperumAn) as explained by nammAzhwAr in thiruvAimozhi 6.10.10 "amarar munikkanNanGgaL virumbum thiruvEnGgataththAnE" (அமரர் முனிக்கணங்கள் விரும்பும் திருவேங்கடத்தானே) meaning one who is liked by both amarars and munis. I wanted to enjoy this great beauty and that is why I have arrived here". 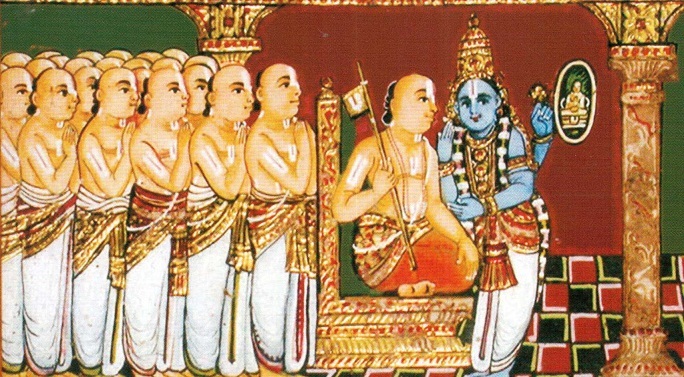 emperumAn then acknowledges udayavar's desire and asks him to come and place his head under his lotus feet (udayavar immediately obliges) and tells him "Always remember these while conducting our sampradhAyam; You are the controller (udayavar) of both nithya vibhUthi and leelA vibhUthi; whoever takes shelter of you are liked by me; reform everyone so they become my devotees; I have ordered you (the leader of my eternal servitors) to incarnate here to uplift everyone; the ones who are related to you have nothing to worry for; I have incarnated many times but returned without being able to reform many; I am now satisfied that you will be able to fulfill my desires and just continue to do that". Thus thiruvEnkatamudayAn established udayavar's uththArakathvam. AchAryan should make his sishya (with submissiveness and anjali) stand on his right side. He should keep his right hand (which will deliver knowledge to the sishya) on the sishya's head and he should keep his left hand on the sishya's chest and should see the sishya with his merciful eyes. Meditating on his own AchAryan, softly chanting the guru paramparai first, surrendering to emperumAn, the AchAryan should perform dhvaya mahA manthra upadhEsam (which has its own rishi, chandhas and dhEvathai) to the sishya. Hearing this nambi said "Long ago, in bhadrikAshramam, I myself appeared as nArAyaNan (AchAryan) and naran (sishyan) and revealed the thirumanthram. At that time, after becoming the sishya, also became the AchAryan myself. I had an unfulfilled desire to have an AchAryan who is qualified enough to be my AchAryan but different from myself so that I can hear the meanings of thirumanthram from him. That desire has been fulfilled by you now. From today onwards I am also a part of rAmANuchamudaiyAr (ராமாநுசமுடையார்) meaning one who have the relationship with emperumAnAr. Today I have become a srivaishnava nambi". We can understand that this act of becoming the sishyan of emperumAnAr is the epitome of nambi emperumAn's svAthanthriyam. emperumAn who is the prathamAchAryan for every one, himself happily wanting to become a sishya of emperumAnAr shows that emperumAnAr is uththAraka AchAryan for everyone. In his final days, when his sishyas ask nadAthUr ammAL what is their refuge, he replies "bhakthi and prapathi are not fit for your svarUpam; Simply take shelter of emperumAnAr and fully depend on him; your ultimate goal will be accomplished". sOmayAjiyAr (sOmAsiyANdAn), after surrendering to emperumAnAr, performed kainkaryam to him for some time and returned to his native place "kArAnchi" and lived there for some time. After some time, he wants to return to emperumAnAr but since his wife does not allow him to leave, he makes a vigraham of emperumAnAr. Since it did not come out to his satisfaction, he uses that vigraham and again gets the AchAri (sculptor) to make another one. That night, emperumAnAr appears in his dream and asks him "Why are you destroying my old vigraham to make a new one. Wherever you are, if you are not able to have full faith in my abhimAnam as uththArakam, how are you going to develop attachment towards my vigraham?". Suddenly woken up after the dream, sOmayAjiyAr immediately keeps the vigraham in a safe, gives up his wife and leaves to srIrangam. After arriving in srIrangam, he runs to emperumAnAr, falls at his lotus feet and starts crying". emperumAnAr asks him "what is the matter?" and he explains the incidents and the dream. udayavar tells him with a smile "Welcome oh ignorant! I did this to relieve you from the dependence on your wife; even if you dont appreciate me, I will never give up on you. Wherever you are, due to my abhimAnam towards you, your ultimate goal is guaranteed. Give up all worries and stay happily". This incident is explained by periyavAchAn piLLai. He loudly declares in front of the assembled srivaishnavas that, for everyone in this prapanna kulam, emperumAnAr's lotus feet is the refuge and he is the saviour. In the next section, we will see more idhihyams on udayavar's uththArakathvam.